In the early 1800′s Jane Austen was a frequent visitor to Fredville Park . 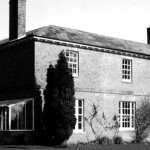 She often stayed with her brother Edward and his wife Elizabeth, the daughter of Sir Brooke Bridges of Goodnestone Park, at Rowling House on the Bridges estate in neighbouring Goodnestone parish. 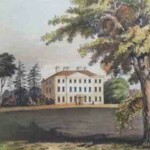 In 1797 Edward inherited Godmersham Park from some childless relatives who had adopted him as their heir, as part of the adoption Edward changed his surname from Austen to Knight, and he left Rolling House and moved to Godmersham. 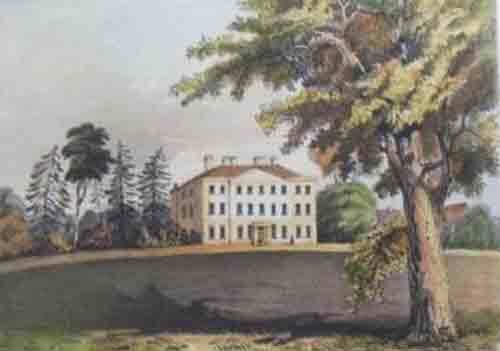 An early 19th century view of Goodnestone Park, the home of Sir Brook Bridges, Bart. After her brother’s move to Godmersham Jane continued to visit Goodnestone and frequently wrote to Cassandra, her only sister, of the visits and short stays she made to Fredville with Mr. John Plumptre and his wife and their children, John Pemberton and Emma. Jane often referred to John Pemberton Plumptre as ” J.P.P” in her later letters.Regular visits were also made to see William Hammond and his family at nearby St. Alban’s Court. Jane often commented on how keen both men were on shooting and hunting, and reported how she and members of the Plumptre, Bridges and Hammond families went to the races on Canterbury race course and afterwards attended balls and soirees in Canterbury. During its heyday , from around 1760 to 1820, the races were a popular fixture in the area’s social calendar. 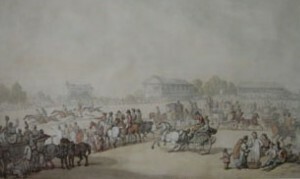 Horse racing took place there between 1729 and 1879. The course was situated on Barham Downs just across the Wingham Road from Nonington parish. In one letter written to Cassandra in September, 1813 Jane said of her friend George Hatton, ”He is so much out of spirits, however, that his friend John Plumptre is gone over to comfort him, at Mr. Hatton’s desire. He (J.P.P) called here this morning in his way. A handsome young man certainly, with quiet, gentlemanlike manners. I set him down as sensible rather than brilliant. There is nobody brilliant nowadays”. The Canterbury Races by Thomas Rowlandson, 1804. The picture is now in the old Beaney Institute, now the Beaney House of Art & Knowledge, in Canterbury High Street. 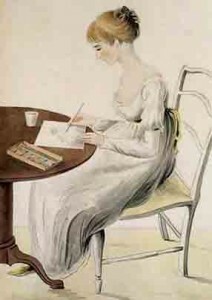 Fanny Knight, a water-colour by Cassandra Austen, Jane’s sister. During the latter part of 1814 Jane’s niece Fanny Knight, the daughter of her brother Edward, wrote to Jane asking her advise as to whether she should marry J.P.P., who was described as gentlemanly and wise; but also religious and too serious. Jane’s advise regarding his firm religious beliefs was ”don’t be frightened by the idea of his acting more strictly up to the precepts of the New Testament than others” but she further counseled “ Anything is to be preferred or endured rather than marrying without Affection; and if his deficiencies of Manner &c &c strike you more than all his good qualities, if you continue to think strongly of them, give him up at once”. Fanny decided against marrying J.P.P. J.P.P. married Catherine Methuen in 1818 and in 1820 Fanny married Sir Edward Knatchbull, a widower some years older than herself and they went on to have nine children. In 1833 J.P.P. was elected to Parliament as one of the two M.P.’s for Eastern Kent, the other M.P was Sir Edward Knatchbull! The courtship of Fanny Knight and John Plumptre was the subject of “Miss Austen Regret’s”, a B.B.C. drama broadcast in 2008 with Tom Hiddleston as Mr. John Plumptre and Imogen Poots as Fanny Knight.